Are Children Of Bodom revealing a softer side for album #10? How’s the recording been so far, Alexi? That’s good – so you’ve not faced any hiccups or challenges at all since you’ve been in the studio? It’s OK, we’re all secretly superstitious. How’s the album sounding? Why is it better than you thought it would be? So, recording-wise, did you change things up a lot? Have you started working on the lyrics? Is there anything on this album that will surprise or shock fans? Can we expect the unexpected? Have you purposefully tried to experiment a little with this record? Well, typically, Bodom songs are super-heavy, fast-paced and full of riffs. Will there be any slower tracks? 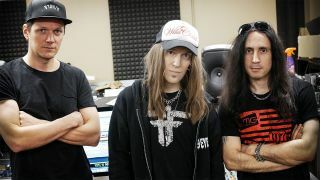 The new Children Of Bodom album will be out later this year via Nuclear Blast.